What is the treatment for aortic aneurysm? Can an aortic aneurysm be cared for at home? What is the medical treatment for aortic aneurysm? What about surgery for an aortic aneurysm? Can an aortic aneurysm be prevented? What is the outlook for a person that has an aortic aneurysm? Abnormal enlargement or bulging of the aorta, the largest blood vessel of the body, is not an unusual condition. Health-care professionals refer to this as aneurysm of the great vessel, or aortic aneurysm. The enlargement usually affects only a small part of the vessel, so bulge is a more accurate description. An aneurysm occurs when a segment of the vessel becomes weakened and expands. The pressure of the blood flowing through the vessel creates a bulge at the weak spot, much as an overinflated inner tube can cause a bulge in a tire. The bulge usually starts small and grows as the pressure continues. Aneurysms are dangerous because they can rupture, causing internal bleeding. Bulging can occur in any artery in the body. It is most common in the arteries of the brain and in the abdominal aorta. Bulges in an artery are classified as true aneurysm, false aneurysm, or dissection. In the aorta, bulging can occur anywhere along the entire vessel. It is most common in the abdominal aorta, where it is known as abdominal aortic aneurysm (triple AAA). If it occurs in the thoracic aorta, it is known as thoracic aortic aneurysm. A true aneurysm involves all three layers of the blood vessel wall. A false aneurysm of the artery is contained only by the two outer layers of the blood vessel wall and clot. This is a very fragile condition with high risk of bursting. False aneurysms are usually a result of an infection. Because the abdominal aorta is such a large vessel, a ruptured abdominal aneurysm is a life-threatening event. Fortunately, not all aneurysms rupture right away. Many grow very slowly and cause no symptoms or problems for many years. When detected in time, most aneurysms can be electively repaired with an operation so they do not rupture. Most aneurysms occur in people aged 65 years or older. The number of aneurysms in the United States is increasing as the population increases and ages. Aneurysms are more common in men than in women. A related but different condition is aortic dissection. Dissection refers to a separation of the vessel wall, which allows blood to leak between the layers of the vessel. This further damages and weakens the vessel, placing it at much greater risk of bursting (rupture). Aneurysms usually do not cause any symptoms until they become very large or rupture. Aneurysms in the abdominal aorta are often found coincidentally when the individual undergoes a medical test or procedure for some other reason. Chest pain and back pain are the two most common symptoms of large aneurysms. Almost any unusual sensation or feeling in the upper chest or back, however, may be due to an aneurysm of the aorta. Chest pain is usually the first sign of aortic dissection. Many people describe a tearing or ripping pain in the chest when the aorta enlarges to a critical size and ruptures/dissects. Besides pain, increased sweating, a fast heart rate, rapid breathing, dizziness, and shock may occur. Where the aorta widens into a bulge, blood clots (thrombi) are more likely to form. If a piece of a blood clot breaks off, it travels through the circulatory system until it lodges somewhere. The clot can cut off blood flow to any area of the body. Symptoms depend on which part of the body is deprived of blood. In the most serious cases, the broken off fragments can cause stroke or heart attack. The fragments can also cause one or more vital body organs, such as the lungs, liver, or kidneys, to stop functioning properly. In less serious cases, it might cause numbness, weakness, tingling, pallor, or coldness in an arm or leg, loss of sensation, light-headedness, or localized pain. Any of these symptoms can also occur with dissection of the aorta. The pain in the chest or pain may be particularly severe, and may mimic a heart attack. These symptoms are not unique to people that have aortic aneurysms but they do indicate the person is likely experiencing a medical emergency that could include an aortic aneurysm. A major reason for most of the above symptoms is loss of blood from the leaking aneurysm. If the bleeding is uncontrolled, the person's blood pressure will drop dangerously low. Organs will not receive enough blood to function normally. This is called circulatory collapse, or just "shock." This is a life-threatening condition. People lose consciousness if their brain does not receive enough blood; they then may be at risk of death if the bleeding continues. Other organs may start to fail. The heart can stop beating. This is called cardiac arrest and is often fatal. An aortic aneurysm develops from a weakness in the wall of the aorta. This weakness can be present at birth or can develop as the result of disease or injury. Atherosclerosis: A clogged or damaged artery from a condition called atherosclerosis is the most common cause of aneurysm. Atherosclerosis is often called hardening of the arteries because it calcifies later in life. In atherosclerosis, a fatty substance (cholesterol) called plaque sticks to the lining of the blood vessel wall, weakening the wall. Atherosclerosis is also the most common cause of heart disease and heart attack. High blood pressure: High blood pressure puts stress on the wall of the aorta. Over many years, this stress can lead to bulging of the blood vessel wall. This is the leading factor in development of aneurysms of the thoracic aorta. Diabetes: Uncontrolled diabetes damages blood vessels by premature, accelerated atherosclerosis, leaving them vulnerable to a number of conditions including aneurysm formation. Cystic medial necrosis: In this condition, the medial layer of the blood vessel wall degenerates, and an abnormal fibrous layer weakens the supporting structure of the blood vessel wall itself. This commonly occurs with certain rare inherited conditions such as Marfan syndrome and Ehlers-Danlos syndrome. It also occurs with heart valve disease and pregnancy. Mycotic aneurysm occurs when bacteria spread into the arterial system, invade the blood vessel wall, and weaken the vessel. Often the bacteria enter areas of previous damage or areas weakened since birth. Although rare today, the advanced form of the sexually transmitted disease (STD) syphilis was a common cause of this condition in the early part of the 20th century. Inflammatory aneurysm: Inflammatory conditions or vasculitis, such as psoriasis and rheumatoid arthritis, may produce inflammation in the blood vessel wall itself. If the inflammation is not reversed, it eventually weakens the wall of the aorta. Vasculitis generally affects the smaller to medium-sized vessels and rarely the aorta. Injury: Injury to the chest or abdomen, as in a car wreck or bad fall, can damage an area of the aorta. This leaves the aorta vulnerable to bulging. In many cases, the cause of an aortic aneurysm is never known. Any time a person experiences chest pain or the sensation that something is "just not right" in the chest, consult a medical professional emergently. Have someone take the person to an emergency department; do not let the person attempt to drive themselves. If a person notices a strong pulse sensation, or a pulsating bulge in the abdomen, they should seek a doctor right away. If the pain is new, severe, frightening, or feels to be tearing or ripping, one should go immediately to a hospital emergency department. Do not wait it out; immediate treatment can be life saving for aneurysm/dissection as well as in other conditions that cause chest pain. If an aortic aneurysm ruptures, internal bleeding occurs. This is a medical emergency, because a person can bleed to death in a few minutes. Severe back, flank, or abdominal pain may be the only symptom of an enlarging aorta. Many other conditions can cause these symptoms, but an aortic aneurysm is the most serious of these conditions. Most aortic aneurysms cause no symptoms and are found when a person undergoes a medical test or procedure for some other reason. Others are found only when the individual has symptoms (described previously). The typical symptoms of an abdominal aortic aneurysm are not specific. This means that they could be caused by a number of different conditions. The doctor will probably not know at first what is causing symptoms. He or she will rapidly consider the possibilities and develop a plan for systematically ruling each one out. This evaluation will start with the most serious conditions, and ruptured aneurysm is near the top of the list. If the person is able, they can help by giving a focused, detailed description of how the symptoms started, how they were feeling before the symptoms started, and how the situation once the symptoms started. Because some patients cannot communicate or remember items, it is helpful to arrive in an emergency department with someone who knows or who has access to the patient's medical and surgical history. This is especially helpful if the patient has a documented history of an aortic aneurysm or conditions that might predispose them to aneurysms (connective tissue disease disorders). A full exam, with special attention to the cardiovascular system and abdomen, will give clues to the diagnosis. The doctor may be able to feel a pulsating bulge in the abdomen or hear a loud pulse (termed a bruit) or other signs of aortic enlargement with the stethoscope. The exam findings will guide the rest of the evaluation. Probably the first test that will be performed is an electrocardiogram (ECG or EKG). This is done to rule out a heart attack and other serious heart conditions. A series of electrical wires will be attached to the chest, arms, and legs. The ECG records the electrical impulses that control the beating of the heart. The rate and rhythm of the heartbeat is measured. Abnormalities in the ECG may point to heart damage. Often the ECG result is normal in uncomplicated aortic aneurysm. The test may be repeated after a short time to see if any changes have occurred in heart function. An ultrasound, X-ray, CT scan, angiogram, or magnetic resonance imaging (MRI) of the chest and abdomen may be done. Usually, an aneurysm shows up on plain radiographs only if it has become calcified as a result of atherosclerosis. Ultrasound will show abnormalities in the shape of the aorta. Echocardiography is a special type of ultrasound that shows the heart in great detail. This may be done in certain situations in which heart damage is suspected and/or the thoracic aorta is thought to be involved. A transesophageal echocardiogram is more sensitive and specific; the procedure involves swallowing a long tube with a probe at its distal end. Prior to placement of the probe, local anesthesia is applied to the back of the throat. This probe is very sensitive and can easily identify heart or aortic problems within a few minutes. Aortography is an X-ray procedure done after a contrast or X-ray dye is injected into the bloodstream to show the areas where blood is flowing. This study highlights blood vessel abnormalities, such as bulges, and confirms the diagnosis of an aneurysm. Aortography involves inserting a catheter inside the body and aorta, with its associated risks. A CT scan is an X-ray that shows much more detail of the organs, blood vessels, and other structures inside the body. It requires the use of a dye, which can damage the kidney in rare cases. MRI is also a highly specialized technique that gives a very detailed view of the soft tissues inside of the body. CT scan and MRI have largely replaced aortography. The only hazard of CT scan and MRI is that the patient is transported and manipulated in a radiological suite for about 20 to 30 minutes, which may not be advisable for a patient with low blood pressure. If an aortic aneurysm is strongly suspected, most emergency medical staff choose to notify a surgeon early in the diagnostic process. Aortic aneurysm is a medical emergency. If you or someone you know is experiencing symptoms of aortic aneurysm, seek medical care immediately by calling 911 or activating the medical emergency system in your area. Do not try to treat anyone at home or to wait and see if the symptoms will resolve. Severe chest, abdominal, or back pain, especially with symptoms that suggest internal bleeding, requires immediate, expert medical attention and rapid diagnosis. In an estimated 20% of cases, the first sign or symptom of an unrecognized abdominal aortic aneurysm is rupture that leads to sudden death from massive blood loss. The treatment of this condition depends on the patient's overall health, the size and location of the aneurysm, and whether the person is having symptoms. The risks and benefits of surgery for abdominal aortic aneurysms (AAA) are different than those for thoracic aortic aneurysms and are listed below. Abdominal aortic aneurysms are unlikely to rupture if they develop slowly, are less than 5.5 cm (about 2 inches) in diameter, and are causing no symptoms. In these cases, the risk of rupture over the next 5 years is considered negligible. The risks involved with surgery outweigh the risk of the aneurysm rupturing. Close monitoring of the aneurysm size is the proper treatment for most people. Ultrasound/CT scan every 6 to 12 months is the usual monitoring strategy. This may vary by individual patient and doctor. As the aneurysm enlarges to greater than 5.5 cm, surgical correction is the usual treatment of choice. However, small adults (women) and large men may be judged as candidates for surgery with either less or greater aortic diameters, respectively, by their consulting surgeon. However, asymptomatic patients with inflammatory abdominal aortic aneurysm or abdominal aortic aneurysm that have caused symptoms of emboli, pain, or bowel obstruction usually require emergent repair regardless of aneurysm size. Any abdominal aortic aneurysm larger than about 2 inches (5.5 cm) in size requires surgery to repair it. Aneurysms that are enlarging rapidly, causing symptoms, or showing signs of probably rupture (such as leaking) require immediate surgery. Delaying this surgery puts the patient at even greater risk of a rupture. The risk of rupture of an abdominal aortic aneurysm greater than 2.7 inches (7 cm) in diameter in average-sized individuals is almost 20%. 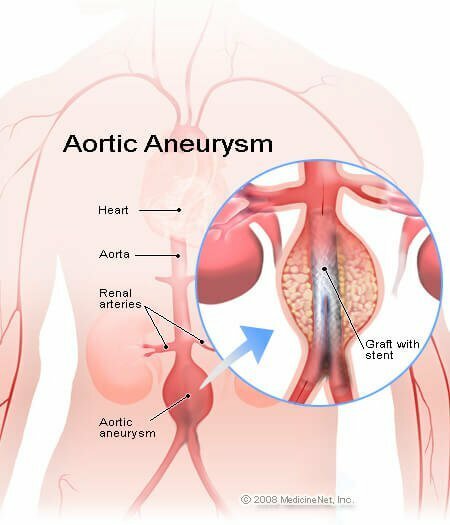 Thoracic aortic aneurysms may originate in either the ascending or descending aorta and, because of their closer proximity to the heart than abdominal aortic aneurysms, they have greater potential to harm the heart or create other problems related to the heart. The need for more aggressive treatment is balanced by the higher risk of surgery closer to the heart. Generally, about 2.3 inches (6 cm) is the critical size for atherosclerotic aneurysms. Any thoracic aortic aneurysm 6 cm or larger requires surgery, but if the patient has Marfan syndrome or a familial history of aneurysms, 5-cm aneurysms are considered for surgery. Aneurysms at the aortic root (nearer the heart) are prone to rupture at sizes closer to 5 cm and must be treated more aggressively. In most cases, a medication (beta blocker) that lowers blood pressure and relieves stress on the artery wall will be given to reduce the stress on the weakened part of the vessel. Lowering of blood pressure is usually done in the intensive care unit with intravenous medications and continuous monitoring of the blood pressure. Although a ruptured aortic aneurysm can be repaired by surgery, these cases tend to be less successful than in those individuals who undergo surgery for unruptured aneurysms. Generally only about 50% of people who undergo urgent surgery for repair of a ruptured aneurysm survive. Even in those who survive surgery, kidney failure, dead bowel, and leg ischemia are common complications. However, even asymptomatic patients with inflammatory abdominal aortic aneurysm or abdominal aortic aneurysm that have had symptoms of emboli, pain, or bowel obstruction require emergent repair regardless of aneurysm size. Open surgery has long been the accepted treatment for aortic aneurysms of the chest or abdomen. A large incision is made in the chest or the abdomen. Blood flow in the aorta is stopped by hooking the circulatory system to an outside pump (heart and lung machine). This machine circulates blood to the body and keeps the vital organs and other tissues oxygenated properly. The damaged section of the aorta is removed and replaced by an artificial blood vessel (graft) made of cloth fabric. The graft is sewn in place. Although this surgery is usually successful, it has its own risks to the heart, brain, lungs, and kidneys. It also involves considerable recovery time because of the size of the incision and complexity of the surgery. Usually a patient has to stay in the hospital for a week, and recovery time is at least 6 weeks. Treatment for these aneurysms has recently focused on procedures that are less invasive than conventional surgery. One widely used alternative is stenting of the aneurysm by a vascular surgeon or an interventional radiologist. A stent is a tiny metal and fabric device like a miniature scaffold. It is threaded through the blood vessel from a small incision, usually in the groin. A thin plastic tube called a catheter is used to thread the stent through the blood vessel. The stent is fastened to the inner vessel wall just above the level of weakened aortic wall to help support the blood vessel. This reduces strain on an existing aneurysm and can prevent a full-blown aneurysm from developing again. Stenting is not only much faster than conventional surgery; it offers much shorter recovery time and fewer complications. In 2006, stenting surpassed open surgical techniques in terms of numbers of aortic repairs. However, stent complications include endovascular leaks that may require a secondary procedure. The long term outcome of stenting is still under study. The appropriate choice of procedure, open versus stenting, depends on many factors and is best determined by for each individual by their primary doctor and vascular surgery team. Picture of a stent in an abdominal aortic aneurysm. Surgical repair of these aneurysms often requires full cardiopulmonary bypass by a thoracic surgeon. Stenting of thoracic aortic aneurysms has been shown to be possible, but it is most often done only on the descending thoracic aorta. No medicine can prevent an aortic aneurysm. However, measures can be taken that will help keep blood vessels healthy and strong. Get active: Take part every day in some activity that increases heart rate to the rate recommended for the patient's age and overall condition. At least 30 minutes a day is ideal. Control blood pressure; the above methods can help and if necessary, the doctor may prescribe medication. If a person is found to have an aortic aneurysm less than 5 cm in size, it should be watched carefully by their primary care doctor. Regular ultrasound examinations will detect any growth or other changes in the aneurysm. Some experts recommend screening for all individuals older than 55 years. Screening would detect many aortic aneurysms that otherwise go unrecognized because they cause no symptoms. Ultrasound examination of the abdomen is more than 80% accurate in screening for the existence of abdominal aortic aneurysm. Physical exam may not detect an aneurysm. With prompt diagnosis and proper surgical treatment, most people recover fully. Treatment usually requires minimal alteration of lifestyle, although recommendations to avoid dietary fat and smoking and to control blood pressure may allow patients to prevent further damage to their blood vessels. Because these conditions most often occur in elderly people with other medical conditions, recovery can be prolonged and difficult. Blood clot: Where the aorta widens into a bulge, blood clots (thrombi) are more likely to form. If a piece of a blood clot breaks off (embolizes), it travels through the circulatory system until it lodges somewhere. The clot can cut off blood flow to any area of the body. Symptoms depend on which part of the body is deprived of blood. Internal bleeding: In ruptured aneurysm or dissection, internal bleeding will occur. If individuals have symptoms associated with internal bleeding, they are in danger and must seek emergency medical care right away. Circulatory shock: If anyone bleeds enough, their blood pressure will drop dangerously low. Organs will not receive enough blood to function normally. This is called circulatory collapse or often just "shock." It is a life-threatening condition. abnormal mental function or confusion. American Heart Association. "Guidelines for the Diagnosis and Management of Patients with Thoracic Aortic Disease. American Heart Association. "Aortic Aneurysm Fact Sheet." Center for Disease Control and Prevention. Updated: June 16, 2016. Rahimi, S. A., MD. "Abdominal Aortic Aneurysm Treatment & Management." Medscape. Updated: Sep 28, 2015. Tseng, E., MD. "Thoracic Aortic Aneurysm." Medscape. Updated: Jul 20, 2016. What symptoms did you experience with your aortic aneurysm? Please share your experience with aortic aneurysm. What was the cause of your aortic aneurysm, or that of a friend of family member if known. Please share your experience with aortic aneurysm and surgery.